My aesthetics are not the best. I know good design when I see it but creating great design? Not so much. I need to borrow from things that inspire me so I'm always on the lookout for experiences that leverage both subtleties, like background images, and not-so-subtleties, like cool navigational tools. Even small design improvements can have huge positive effects. This is why we created our design accelerators. Design accelerators are freely available, pre-built media files, assets and spaces you can insert into your experiences to give them extra polish and shine. Consider them instant inspiration resources you can borrow and then - depending on the accelerator - modify. 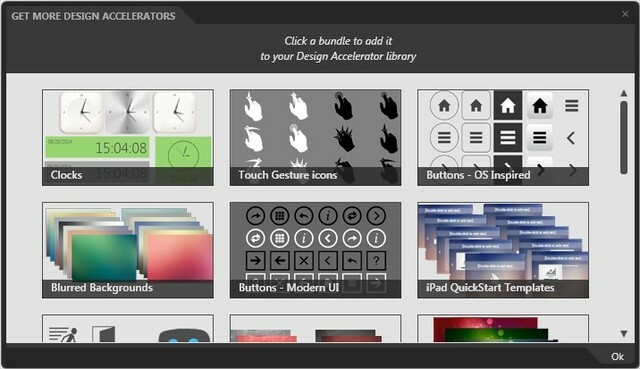 Design accelerators - or DAs - are organized in what we call bundles and you can see a summary of available DA bundles on our website. However, use of DAs occurs directly in Composer. Take a look over on the right side of Composer. You'll notice two tabs, one referred to as the Content Library, the other as Design Accelerators. Select the latter tab to view all preinstalled DAs. To view other DAs available for download, click the little rainbow-colored cloud icon at the top right. There are many different kinds of DAs. Image and video background DAs don't just add the image or video into the Content Library, they automatically set the Background property. The menu DAs incorporate animation actions so all you need to configure are the button text and button pressed actions. You will find custom shapes, sound effects, "sketch" assets for creating mock-ups and much more. Now you know how to jump start your Intuiface experiences, giving them a professional look and feel regardless of your design skills.